Very good! Very simple! I'll be keeping this one! Here are my revisions, taken, in part, from other reviewers observations. Start with a VERY light sprinkle of garlic powder, salt and pepper. Evenly spread fresh basil, coarsely chopped. 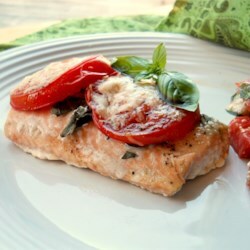 I grated fresh Parmesan directly onto the salmon and then again on top of Roma tomato slices. Another light sprinkle of salt and any leftover basil before a drizzle of olive oil. I let the salmon sit for about 30 to 45 minutes to allow it to soak up the flavors before baking it for 15 mins., followed by about 2 to 4 mins. under the broiler. I also think it should be served with a lemon wedge, it seemed to need a bit more citrus than what the tomatoes alone provide. Served with couscous and a salad of mixed greens.